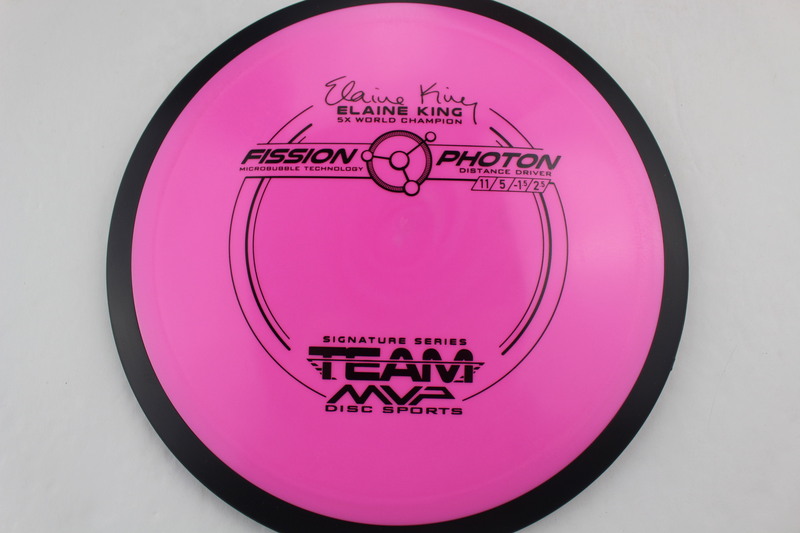 Fission Photon – An awesome variation made for 5x World Champion Elaine King! A Team MVP Signature Series release of the Fission microbubble technology plastic for the super popular Photon Distance Driver. Elaine King won 4 straight World Championships from 1991-1994 and won her 5th in 1997 in her home state of North Carolina. The Photon is a versatile 11 Speed driver that right up at the top of the the popularity list for MVP’s drivers. 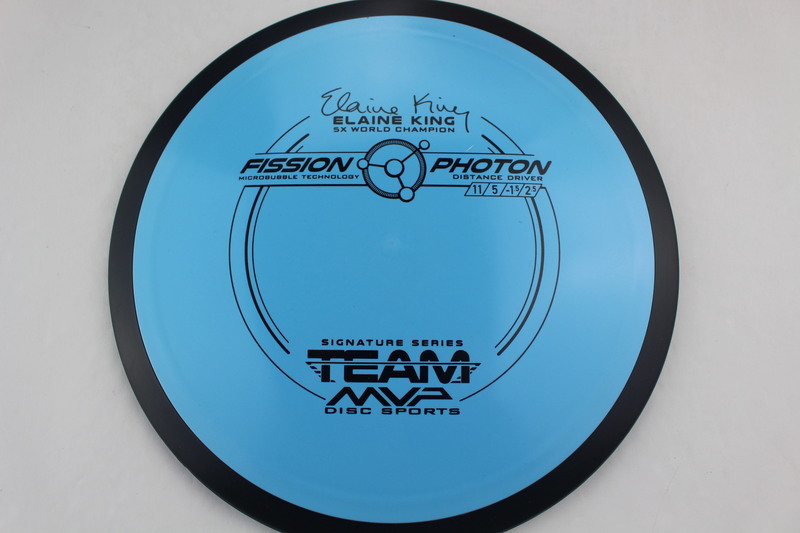 This plastic variation gives an extra 0.5 to the turn vs the standard varation. -1.5 turn vs -1. Red Black Black 152g Pretty Domey Pretty Gummy $16.51 Just 1 left! Red/Orange Black Black 148g Pretty Domey Pretty Gummy $16.51 Just 1 left! Red Black Black 157g Pretty Domey Pretty Gummy $16.51 Just 1 left! Light Blue Black Black 147g Pretty Domey Pretty Gummy $16.51 Just 1 left! Light Blue Black Black 142g Pretty Domey Pretty Gummy $16.51 Just 1 left! Light Blue Black Black 152g Pretty Domey Pretty Gummy $16.51 Just 1 left! 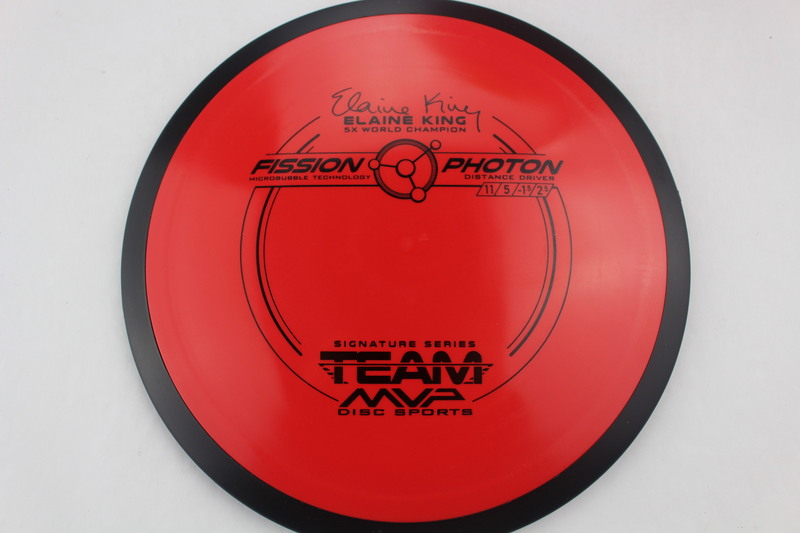 Pink Black Black 168g Somewhat Domey Somewhat Gummy $16.51 Just 1 left! 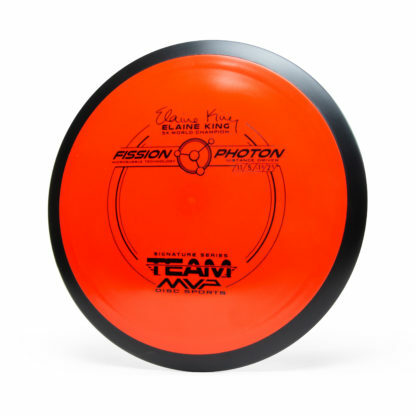 Orange Black Black 169g Somewhat Domey Somewhat Gummy $16.51 Just 1 left!